Members of Stoneyford Somme Association were joined by invited guests for the official unveiling of the village’s new-look war memorial. The memorial has undergone a programme of improvement works in recent weeks costing around £2,000, funded by donations from the local community. As part of the work, new fencing has been put up and two metal statues depicting soldiers with their heads bowed have been erected either side of the memorial. The parade and service of rededication on Saturday night was attended by members of the Somme Association, former service personnel, local residents, Orange Order brethren and political representatives. The service was conducted by Rev John Farr from St John’s Church of Ireland in the village and wreaths were laid by Lagan Valley Ulster Unionist Party Assemblyman Robbie Butler, Major Hunt, Douglas Harbinson from the B-Specials Association and David Campbell, deputy master of LOL 146. The new sculptures were officially unveiled by Mr Butler and Mr Harbinson. A number of ex-servicemen and local visiting Orange Order brethren were among those who took part in a parade through the village after the ceremony. Ian Crawford, chairman of Stoneyford Somme Association, was delighted with the turnout for the parade and service and thanked all those who attended. “It was a very successful event. 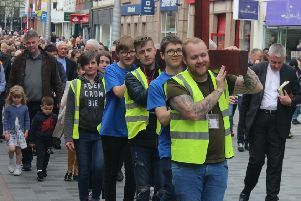 There was a really good wee crowd turned out for it – a lot of local people came out for it as well,” he said.